These are items that I have used once upon a time but no longer use, either 'cos I don't need to use them any more or 'cos I found them to be inferior. Reasons for not using them anymore are stated below the respective items. All of these products & their prices are from Pet Lover's Centre unless otherwise indicated. 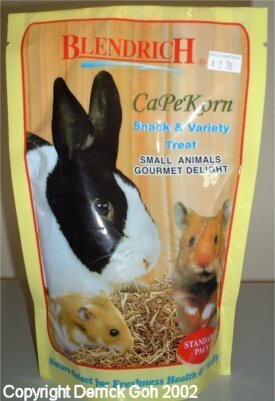 This was the first cavy feed I fed my girls. 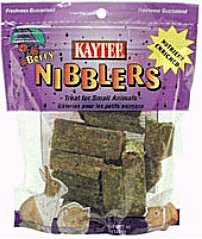 It has a wierd smell & cavies tend to eat only the pieces they like & leave the rest. After finding out that mixes are bad, I decided to change to pellets so naturally I don't use it any more. This is available in 2, 5 & 10 pounds bags although I've never seen the 10 lb one in Singapore. 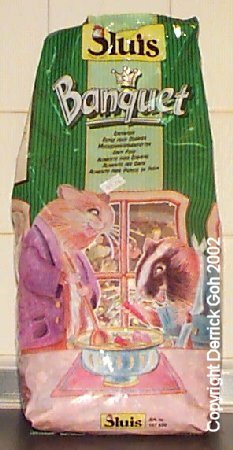 Has a nice aroma & is the second cavy feed I fed my girls. Kaytee's distributor is Tri Alba & they can be contacted at 6466 0462 or email them at trialba@singnet.com.sg. I gave up using it 'cos I learnt that it contains Ethoxyquin which is harmful. 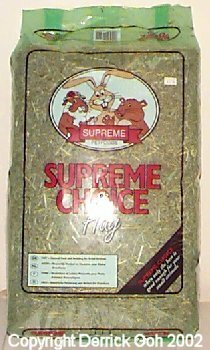 Besides its alfalfa based which isn't great for more mature cavies. I replaced this with Oxbow Cavy Cuisine. I used to give 1 cube every month as a treat. However I stopped when I found weevils crawling out of a pack. It also went mouldy very quickly. Nowadays I prefer feeding Vitakraft Alfalfa Slims. I gave up on Berry Nibblers after the first time. Even though they were in a ziplock bag, I found 2 tiny flying insects inside when I opened the bag. Upon closer inspection, I noticed larvae crawling from inside some of the pieces. It was a ziplock bag so the larvae or moth couldn't have entered. This means the larvae must've been inside the nibblers & hatched into moths. 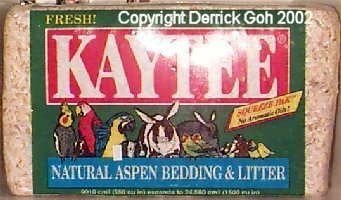 I suggest you be very careful when using this treat or any other Kaytee product, as Kaytee has proven time again that their products aren't too fresh! 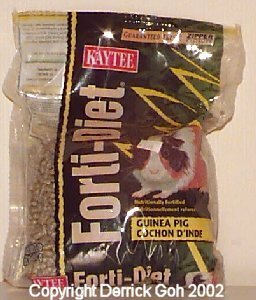 Comes in a resealable ziplock bag like the Forti-diet pellets. Has quite a few chemicals. Some are sources of vitamins but there are about 16 which are not. I have no idea what those 16 are used for. Also has 2 types of preservatives. Probably one of the less "healthy" snacks due to the fact that it has quite a few chemicals & not 1 but 2 preservatives. I no longer use it 'cos it contains 2 preservatives including Ethoxyquin. Comes in an airtight plastic bottle which is better than Vitakraft's cardboard box 'cos its less likely to turn mouldy. My girls not as enthusiastic about it compared to the Vitakraft fruit flavoured drops. Takes them almost a day before they pick about & eventually finish it. 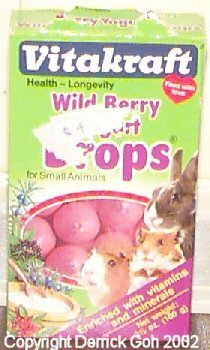 Since my cavies are obviously not too keen on this, I no longer buy them. Besides it is high in sugar & thus isn't too healthy. When I first saw this treat I felt it resembled those black dried pods that fall off trees. Only it has been broken into small chunks. Not much info is provided on the pack & it only says it contains locust beans. Doesn't appear to be any other ingredients. Smells quite sweet, a little like Vitakraft meadow hay & is hard like a rock. My cavies don't seem that fond of it so I don't buy it anymore. Below is a pic of what it looks like. 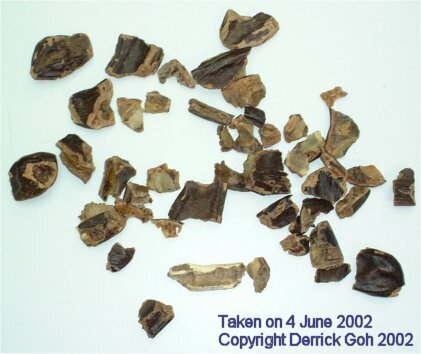 Its mostly the outer "pod" shells that have been broken. There are some beans inside the pods. They are all dried. The nuts & stuff are basically "mounted" on a wooden stick & there are 2 sticks in each box. It comes with a plastic hook that lets you attach the stick to the cage. Fallen pieces can be placed in bowls to reduce wastage. I stopped feeding this 'cos its high in sugar & besides they already get nuts & stuff in their 8 in 1 Veggie Nut treat. These contain juniper berries, elder berries & mountain ash berries & are enriched with vitamins & minerals. My box went mouldy probably 'cos I left it exposed. But anyway I no longer feed this 'cos its not too healthy 'cos of the high sugar content. 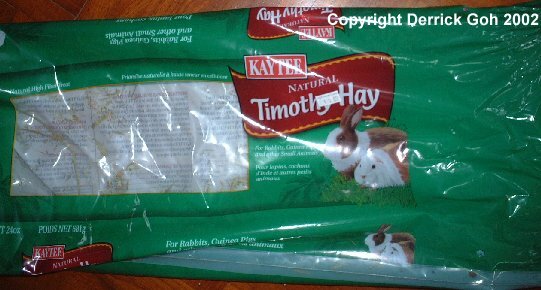 I used to use Kaytee timothy however the quality of their hay has deteriorated some what. Their hay has gotten coarser & is now too finely chopped (keeps falling thru the hay rack). The colour is also rather yellow & unappetising. 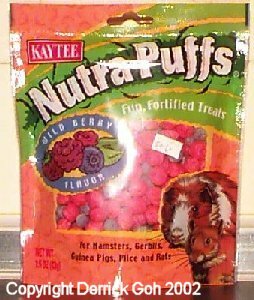 But what made me give up on Kaytee was the 2 incidents when I found junk in their bags of hay. The first time round I found a large piece of duct tape & the second time I found what appeared to be a small dehydrated piece of snake (it was scaly & smelt putrid!). More details on my "General Advice" page. Even though there has been some improvements recently, I am not keen to try Kaytee again especially with other alternatives. 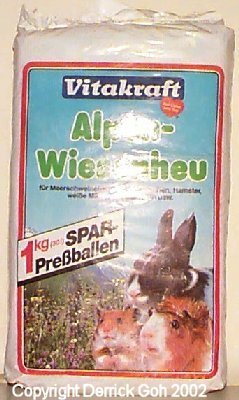 Alpenwiesenheu is translated as "alpine meadow hay". My cavies didn't like it too much so I used up the whole lot as bedding together with newspaper when Oreo had an operation & had to be seperated from the others. Since they didn't enjoy it, I no longer buy it. This is also meadow hay but is not as fragrant as Vitakraft's meadow hay. Probably the cheapest & largest bale of hay available. When Oreo had to be in a seperate cage after her operation, I had to buy meadow hay as bedding. But now that Oreo's okay & I know they don't enjoy meadow hay, I no longer buy it. Supreme's distributor is Aurisys International. I tried using this as litter but it wasn't good at odour control & moisture absorbancy so I no longer use it. This comes in a huge bag containing 15,485 cm3 of compressed shavings which expand to 30,970 cm3 or roughly twice its size. 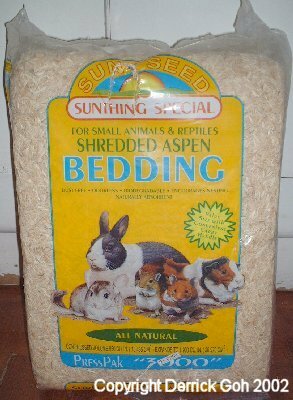 I experimented with this as litter for my cage's removable tray & felt it wasn't suitable. It didn't do a good job of controlling odours & I had to change it daily since its moisture absorbancy was poor. 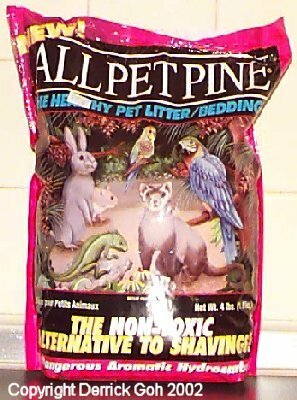 Hence I no longer use it & prefer to stick to All Pet Pine or Feline Pine. I used to fill my cage's removable tray with this but I no longer need to 'cos I've covered the plastic grid with Coroplast & use my cage as a normal plastic bottom cage now with Breeder's Choice bedding. 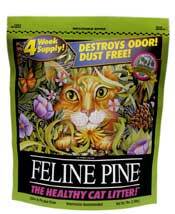 Feline Pine's manufacturer is Nature's Earth Product & the local distributor is Scope Trading Agency. They can be contacted at 6757 0103 or scopetrade@pacific.net.sg. 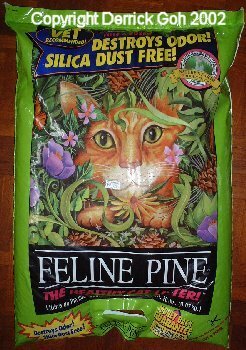 I used to buy All Pet Pine when Feline Pine was out of stock 'cos both are similar except FP pellets are longer. However I no longer need FP or APP. Reasons given above. I bought this from Pet Lovers Centre at Simei but I supposed other branches should sell it. At first my cavies took to it immediately & started chewing it. However they soon tired of it & now only take a few bites. 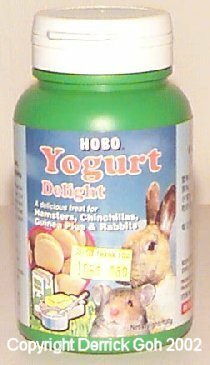 Even though its cheap, I don't bother buying it anymore since they don't really chew it much. If you do buy it, I'd advise you to chuck it out once it gets too stained with pee or poo. A damp piece of wood can get mouldy easily. Make sure you don't spray this directly on your cavy. Instead use a cloth or piece of cotton wool & spray on it. Use the wool or cloth to wipe your cavy. Be very careful if wiping near the face. The eyes & nose should be avoided at all costs. I suggest you avoid the private parts too! Besides using it on your cavy, you can use it on your cage too although it is more for plastic bottom cages. Not much to spray on for wire bottom cages! After Oreo's lice problem was solved, I don't use this anymore but its on stand by just in case (touch wood!). I forgot the price but this came from a vet before I realised he sucked! Be very careful to avoid the eyes & nose. In fact you should never powder the face. Use a lice spray on a cotton wool & wipe the face instead. Be sure you massage the powder into the fur well. What's even more important is getting rid off as much powder as possible. 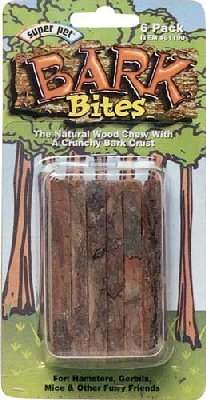 After Oreo's lice problem was solved, I don't use this anymore but its on stand by just in case (touch wood! ).